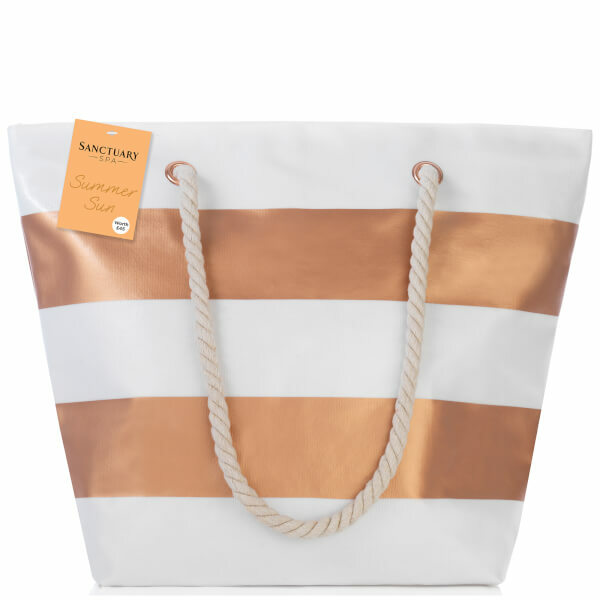 Feel perfectly pampered with the Sanctuary Spa Summer Sun Beach Bag; a shower puff and seven of the brand's favourite bath and body treats housed in a striped beach bag. An ultra-light mist infused with a nourishing blend of Jojoba, Sweet Almond Oil and Vitamin E to leave skin feeling replenished and rejuvenated with a healthy-looking sheen. 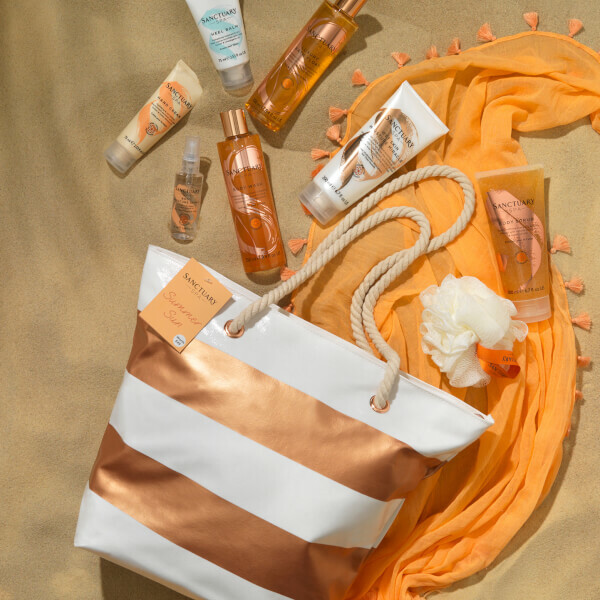 Simply spritz and smooth onto the body for instant hydration and a super soft finish. Moisture Spray: Generously spritz and then smooth onto skin. Avoid contact with eyes. Bath Float: Aqua (Water), Sodium Laureth Sulfate, Caprylyl/Capryl Glucoside, Cocamidopropyl Betaine, Sodium Chloride, Parfum (Fragrance), Phenoxyethanol, Sodium Benzoate, Citric Acid, PEG-250 Distearate, PEG-40 Hydrogenated Castor Oil, Polyquaternium-10, BHT, Tetrasodium Glutamate Diacetate, Butyl Methoxydibenzoylmethane, Tocopheryl Acetate, Sodium Hydroxide, Saccharide Isomerate, Propylene Glycol, Hydrolyzed Adansonia Digitata Extract, Freesia Refracta Extract, Carbomer, Hexyl Cinnamal, Linalool, Limonene, Benzyl Salicylate, Benzyl Benzoate, CI 15985 (Yellow 6), CI 14700 (Red 4), CI 19140 (Yellow 5). Moisture Spray: Paranum Liquidum (Mineral Oil), Isopropyl Palmitate, Cyclopentasiloxane, Parfum (Fragrance), Tocopheryl Acetate, Prunus Amygdalus Dulcis (Sweet Almond) Oil, Simmondsia Chinensis (Jojoba) Seed Oil, Tocopherol, Hexyl Cinnamal, Linalool, Limonene, Benzyl Salicylate, Benzyl Benzoate, Coumarin, Citral.